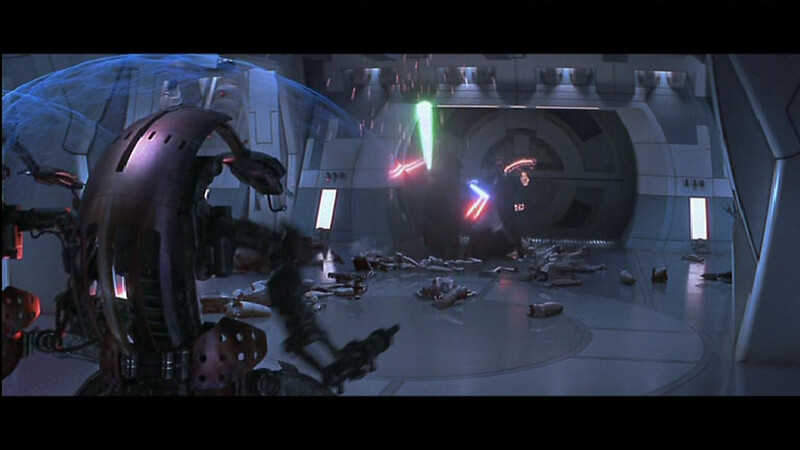 In Star Wars, a force field, sometimes called an energy field, seemed to be a very broad, general term for any type of field, most commonly artificial, in which matter or energy was manipulated through some type of force. Artificial force fields tended to be ‘projected’ from a single device, and thus normally had a certain radius over which their effect gradually weakened to the negligible. Energy from most force fields could usually also be concentrated into a plane, a ‘skin’ around an object, a beam, or even a single point, though this often required more advanced technology. Force fields could be disrupted through outside interference occasionally, such as with the use of a power gem. In real-life, a force field (sometimes known as an energy shield, force shield, or deflector shield) is a barrier, usually made of energy or charged particles, that protects a person, object, or area from attacks or damage. It can also also rapid, room-temperature sterilization of food, medical equipment; and contaminated civilian and military gear. Practical uses for force fields would be for satellite protection (from space dust) in space exploration, and military vehicles, aircraft, and possibly even military establishments. Force fields also exist in Star Trek, Lost, and Halo. A group, from the University of Washington, in Seattle, has been testing a bubble of charged plasma that us intended to surround a spacecraft, contained by a fine mesh of superconducting wire protecting the spacecraft from interstellar radiation and particles of dust without needing a physical shield. Rutherford Appleton Laboratory is designing an actual test satellite, that is intended to orbit Earth with a charged plasma field surrounding it. Plasma windows are slightly similar to force fields, being difficult for matter to pass through. In August 1980, workers at a 3M factory in South Carolina discovered a “invisible electrostatic wall” in an area under a fast-moving sheet of polypropelene film that had become electrically charged to a voltage that “had to be in the Megavolt range”. This phenomenon was a result of Coulomb’s law at work. Rafael Advanced Defense Systems demonstrates their product “Trophy”, a state-of-the-art electromagnetic force field that projects a 360° field around a combat vehicle that stops missiles and other projectiles from hitting it with minimal collateral damage. It works by neutralizing threats fired from short range, and even can neutralize simultaneous threats. It works in high elevation areas, and is applicable to many different military vehicles. The development of Force fields is still an emerging reality and requires more attention in scientific understanding and development to become practical enough for use in space, military, or possibly even every-day-life.